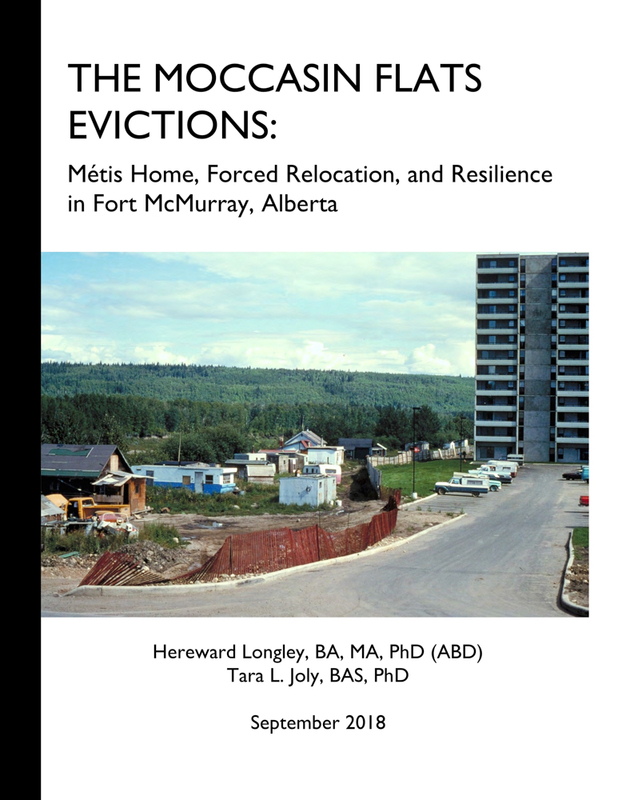 In April 2018, Fort McMurray Métis Local 1935 tasked Tara Joly and me with writing a report about the history of the Moccasin Flats evictions, an important event in the history of the Fort McMurray Métis community. Moccasin Flats was a predominantly Métis settlement along the southern bank of the Snye river at its confluence with the Athabasca River. We carried out oral history interviews and archival document analyses to address the importance of the space, the evictions, the impacts of the evictions, and opportunities for reconciliation. Between 1975-1981 The New Town of Fort McMurray collaborated with Northward Developments Ltd., the housing arm of Syncrude, to evict the Métis families at Moccasin Flats to build the Syncrude Towers housing complex, and a proposed marina, which was never built. By labelling the Moccasin Flats residents “squatters,” the Town used property law to justify their eviction, and ignore their Indigenous identity, history, and rights. The evictions fragmented the Moccasin Flats community. It also disrupted people’s relationships to the land, had cultural and socio-economic impacts, and has been a source of intergenerational trauma. A view of the Snye and Moccasin Flats dwellings (on river bend at left), 1930. P2007.164.1 - Fort McMurray, circa 1930. Fort McMurray Historical Society. Map showing the historical extent and houses at Moccasin Flats, and the relocation trailers. Made with data from several archival maps. View of the Snye River and Fort McMurray showing Moccasin Flats. “Taken from the air showing the junction of the Snye with the Athabasca River,” n/d, PR1970.0302.0005, Provincial Archives of Alberta. Moccasin Flats in 1978 before demolition. Moccasin Flats and Syncrude Towers, 1978. Rene Fumoleau, August 1978, NWT Archives / Rene Fumoleau fonds / N-1995-002: 9380. Registered Traplines in the Fort McMurray area, sheet 74-D-NW, 1957, GR1990.0377.0207, Provincial Archives of Alberta. Map showing traplines held by Moccasin Flats families from 1957 trapline map. 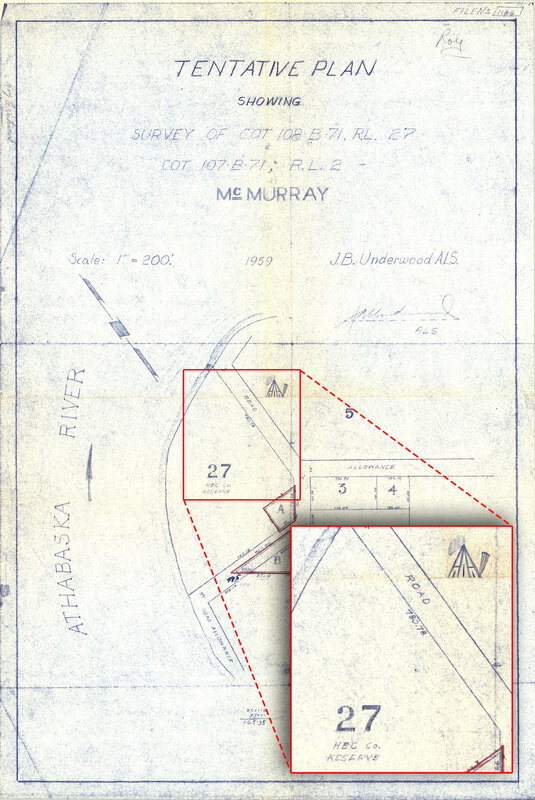 Map of Fort McMurray from 1959 (note tipi at Moccasin Flats). J.B. Underwood, “Tentative Plan showing Survey of COT 108 B-71, R.L. 27 and COT 107-B-71, R.L.2 – McMurray, 1959, GR1971.0080.0096.1598.0002-2, Provincial Archives of Alberta. 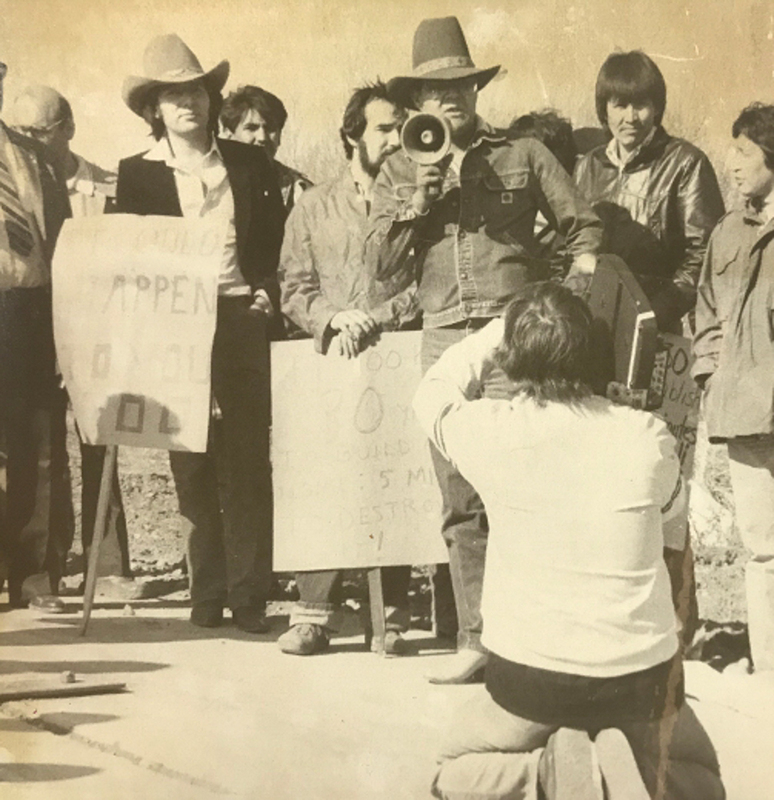 Newspaper coverage of the Moccasin Flats evictions. Fort McMurray Today archives, 1979-1981. Métis Association of Alberta Vice President Joe Blyan protesting the evictions. Fort McMurray Today, May 15, 1981. Moccasin Flats and Syncrude Towers in 2018. Photo by Tara Joly, July 2018.